Guide Dogs has issued a reminder has issued a reminder about the right to ride with your guide dog in taxis after a blind BBC journalist won a discrimination case recently.The Equality Act 2010 states that taxi and minicab drivers must carry assistance dogs unless they have genuine health reasons not to do so and have a certificate of proof. Disabled people’s employment charity JustDifferent has published a poem describing the everyday experiences of one of their staff.The charity employs a team of workshop presenters who create and deliver workshops on a variety of disability and difference topics to school and businesses. 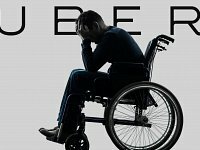 “In my opinion there needs to be tougher regulations for taxi companies when it comes to giving someone the green light to be a driver; and more required training for all drivers on equality.” says Joshua Gardner who was left at the roadside after being told that his chair would not fit in the car. Employment specialists Reed in Partnership and Disability Rights UK have published a new report on Disability and Employment about the challenges disabled people face entering employment.